Elliot Embleton is a hot prospect at Sunderland and is making a big impression during a loan spell at League Two Grimsby Town. The 19-year-old last month extended his loan deal with the fourth tier club until the end of the season, much to the delight of the Grimsby faithful. Embleton was awarded the December League Two PFA Fans Players of the Month after being a key part of the Grimsby side during the month, scoring once. They sit 12th in League Two. And in 20 league appearances this season the young midfielder has scored three times under manager Michael Jolley at The Mariners. We spoke to Grimsby Telegraph reporter James Findlater for the inside track and he had nothing but positives to say about the midfielder. James said: "He’s been the main attacking and creative force for the Mariners since arriving at Blundell Park, and has been a huge reason for the club’s improvement following last season’s brush with relegation. Born in Durham, Embleton has made three Sunderland appearances from the bench last season and has represented England from Under 17 to Under 20 level. 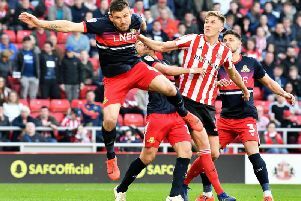 Sunderland are in talks with Embleton over extending his contract, which is due to expire this summer and fans will be hoping they prove to be more successful than those with Josh Maja last month. Grimsby extended the centre midfielders loan until the end of this season after being impressed by his displays in the first half of the season. James Findlater added: "You only have to look at the fans’ pleas before January to see how important Embleton has been to (Grimsby) Town this season. "Michael Jolley was always going to do all he could to keep the midfielder, such has his impact been, and the reaction from supporters to the news that he was staying for the rest of the season tells you a lot about the effect he’s had on the side. "All in all, he’s been a vital part of Town’s side this season, and will likely have a big say in how far up the table they finish."